Rev Dr Oxford Christie (who likes to be known as Ox) is, when we first meet him, aged 38 and very happily married to Barbara with whom he has had two children, three-year-old Billy and five-year-old Martha, with another one soon on the way. He had grown up in Davenport, Iowa, and then attended Harvard Divinity before moving to his first church in St Louis. He had been a Baptist as a boy, and had then joined the Episcopal Church but, after a stint in the army, had come back an atheist: "No God could allow such unmerciful killing. There was no God. We were all an accident." Then he had seen his dead grandfather standing looking at him. Was he an angel? "A belief came to him. A God created everything and set up a system of angels to move everything in the right direction." William (Bill) T Delamar grew up in Durham, North Carolina. 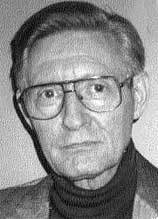 He served in the Navy as a weatherman and earned a BA in American Literature at the University of Pittsburgh and an MA in Organisation Development at Antioch University. He worked in hospital organisation and development for 35 years, in connection with which he wrote numerous articles, but is now retired. He is married to Gloria with whom he had five children. She is also a writer and the two of them co-wrote Brain-Webbing, a handbook on how to stimulate your creativity. Together they run writers' workshops. They live in Melrose Park, Pennsylvania. 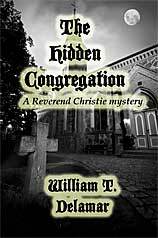 The Hidden Congregation describes how, when Reverend Oxford Christie is sent to the interdenominational Church of the One Soul in Philadelphia ("a castle-like building, surrounded by decay"), his first thought is, what has happened to the congregation? No one has joined the church for many years and the previous minister's portrait is now banished to the basement. The few elderly people who remain are strangely glum and secretive.Though there is a cemetery, there are no graves for the spouses of the remaining members, who refuse to talk about it. Something deeply sinister seems to have happened. Warning: if you don't want any more of the plot given away, skip to the end two paragraphs. Angel, the church secretary, is clearly hiding something, Nehmi, the caretaker, lurks about watching Ox's every move, archaelogist Ammahn seems to be a prospective parishioner, yet he sneaks in and sits in the back pew, never talking to anyone, and talented violinist Cynthia Neal says she ís drawn to the church through sounds emanating from its core, of which only she is aware. This is certainly an arresting situation and the story gets off to a really good start as tension builds as Ox gradually uncovers the congregation's very guilty secret. Unfortunately, the explanation of it all is by no means as satisfying as the build-up, and the revelation of a deadly mixture of unrestrained lust, murder, and even human sacrifice strains conviction. And it's all caused by some particularly potent candle smoke! No wonder Ox gets to admit, "This has been the strangest experience of my life." Ox himself is an interesting character, even if he does not always make a thoroughly convincing clergyman. However, it seems a bit odd that he and his wife wait until their children are aged five and three before his wife suddenly decides they should all take off their clothes so that, as she put it, "Now we all know what Mommy and Daddy and the little girl and little boy look like. We're a family and we're naked." And the way that he seems eventually to condone yet another murder is difficult to accept. Altogether, it's a book that begins really well, but goes on to lose all credibility, as when, after burning someone alive, a member of the congregation suggested, "I think we ought to remove that word 'burn' from our dictionary", with the result that Ox "smiled to himself. They were now able to joke about the problem. The new chapter had really begun. The congregation was being reborn." Well, that's all right then. The author and and his wife (who is also a writer) share a Delamar Web site. The cover is appropriately gloomy.